Is It Me Or Is Kamen Rider Ghost Not That Good? 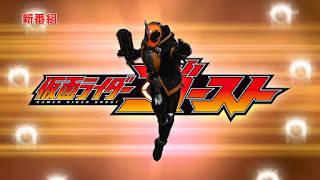 I did like some the episodes of Kamen Rider Ghost but I'll admit that I may still have had a hangover from at least two shows namely Kamen Rider Gaim succeeded by Kamen Rider Drive. Gaim was responsible for filling my void when neither Super Sentai nor Power Rangers could fill it that time. Then there was Kamen Rider Drive which IMO drives miles better than Ninninger (which I felt made dead ninjas glad they're dead) and now it's time for Kamen Rider Ghost. So what's with Ghost? I really felt like maybe I'm not really liking it, it's not good or is soft spot for Kamen Rider Kiva causing it? While I was excited for yet another what could be a "Danny Phantom" like season but unlike Kiva, I don't feel too excited for Ghost even if it is kind of entertaining. Although I watched Kiva much later in my life but I'll admit, I found myself entertained even by Kiva's first 20+ episodes even if I hear some criticisms. What If Jerry Yan And Barbie Xu-Wang Redid All Of The Chin/Liu Qiong Yao TV Series? After watching some Qiong Yao series both new and old, I decided to reimagine what if Jerry Yan and Barbie Xu-Wang became Qiong Yao cast members after Meteor Garden II. After watching Romance in the Rain's two versions namely the 1986 version and the 2001 version, I really thought Jerry and Barbie should've been Shu Huan and Yi Ping. But what if they became a couple for all six TV series let's say Romance in the Rain happened in 2002, no Meteor Garden II and we'd be having Jerry and Barbie play the characters that were once assigned to Chin Han and Leanne Liu/Liu Xue Hua. These TV drama shows are Romance in the Rain, The Unforgettable Character, After Many Red Sunsets, Seagull's Home, Courtyard and Red Love. Was Kamen Rider Drive Meant To Be A Robocop Style Kamen Rider Show? Last year's Tokusatsu year wasn't so good for me with Super Sentai so I really decided to stick through some Kamen Rider. So I'd like to discuss about my road trip with Kamen Rider Drive and how it really affected me as a just flying through Tokusatsu fan. Hearing that Riku Sanjo would do Kamen Rider AFTER Kyoryuger triggered me the panic button. I felt like that "Oh no! It's going to be a disaster." I've always had some biases towards Kyoryuger and no matter how much its fans think that, "It's the best dinosaur Super Sentai ever." I'd pick Abaranger or Zyuranger anyday. While Kyoryuger was horrid but there was some Kamen Rider Gaim to keep me occupied and entertained so I don't go completely backwards with Toku watching. Then it came, Kamen Rider Drive was one show I wanted to give a chance even after Kyoryuger left a bad taste in my mouth. You Thought The Leading Lady Would Die In The End But She Didn't! Are there times you watch a Taiwanese or Korean TV series and you think that the leading lady was going to die? I guess it's because people got too used to tragedies but there are some cases where the dying leading lady got a happy ending instead. Was it meant to be a happy ending all along or did executive meddling change the ending? 100% Senorita had its leading lady Fei Xiang getting some kind of infection that could hit her heart. During that time, she decided that she would use whatever remaining ounce of life she had left to get revenge on Peter. The plot almost made me think that she would die from the infection. So I thought that I wouldn't want to finish it. In the finale, it's revealed that she survived the two operations and came back pretty fine.